Have stiff, straight fronds that can reach up to two meters tall. 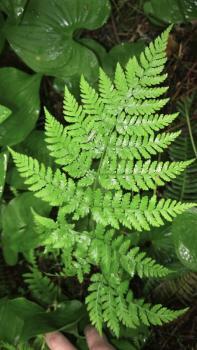 The upper part of the frond is roughly triangular in shape with twice divided segments. The edges of the frond segments may contain spore-bearing sori underneath. The odor of this plant is similar to almond because of the cyanide it contains. In the spring the fronds the fronds come out of the ground looking like a curved shepherd’s hook, and in the winter the fronds will turn light brown and die back. The rhizomes of the plant have a black outside with a white glutinous inside containing inner fibers. Bracken fern is possibly carcinogenic and toxic, it is known to be toxic to livestock and has been found to contain thiamine, which causes thiamine deficiency. In some parts of the world eating the fiddleheads has been linked to causing stomach cancer. The rhizomes would be eaten in large quantities. They were either pit cooked or roasted over a fire till the outer skin and inner fibers could be removed. The remaining white starchy part would be eaten with fish eggs or a type of oil; it was said if it were eaten alone it would cause constipation. Additionally, the inner white portion could be pound into flour like substance and made into cakes of dough that could be roasted and eaten. Like the fronds, the inner fibers could be separated and used as a fire starter. It was said that the inner fibers were slow burning like a match. 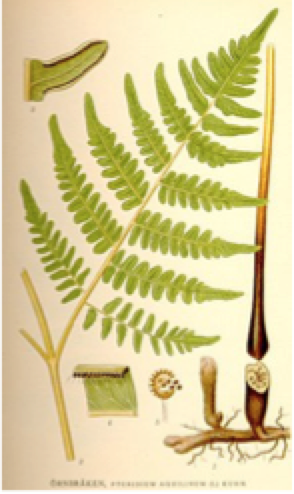 View presentation of how to make fire starters with bracken fern rhizomes here. Kuhnlein, H. V., & Turner, N. J. (1991). Traditional plant foods of Canadian indigenous peoples: nutrition, botany, and use (Vol. 8). Taylor & Francis. Norton, H. H. (1979). Evidence for bracken fern as a food for aboriginal peoples of western Washington. Economic Botany, 33(4), 384-396. Turner, N. J. (1995). Food plants of coastal First Peoples (No. 34). uBC Press.